Pioneering aviatrix Emmaline and her bouncy pilot, Rubberbones, are back for the second installment in the Mad Misadventures series. For the time being, they're safe from the headmistress and monsters of St. Grimelda's School. Their relative calm in the Yorkshire dales, however, is about to be shattered. 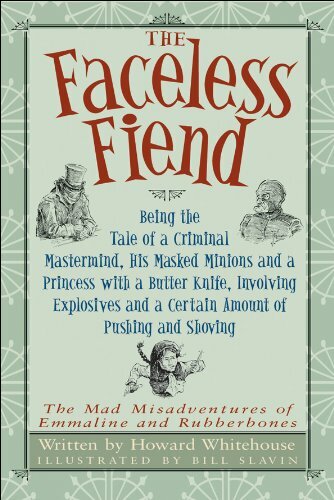 A ruthless master criminal known as the Faceless Fiend wants very much to kidnap their haughty houseguest Princess Purnah, and it's obvious he'll stop at nothing (after all, he has no face to lose). With help from Aunt Lucy, the heroic butler Lal Singh and the hapless Professor Bellbuckle, Emmaline and Rubberbones devise an escape plan so bold, so clever, so completely insane that -- things get a lot worse. Follow our friends into the maze-like depths of darkest Victorian London as the villainous plot to abduct Princess Purnah leads to desperate chases, food fights, ridiculous costumes, balloons over London, famous fictional detectives, rat-killing contests and assorted mayhem.